Fox News and CNN have surveys showing Romney making gains after shifting to a likely voter model. That’s utterly predictable, but the size of Romney’s gains is more interesting. The two polls show Romney gaining 3 and 7 points respectively by applying a likely voter screen, which is larger than we would expect based on past switches and larger than other polls, like this week’s Los Angeles Times/GQR survey which showed Romney picking up just one point as the survey switched to a likely voter model. 1) A large gap between registered and likely voters doesn't necessarily mean that there’s something wrong with the poll. Historically, some firms show larger gaps than others and yet the likely voter polling generally proves accurate on Election Day. 2) Obama probably leads among likely voters. In likely voter surveys conducted since June 18 (yes, this is an arbitrary break to exclude Bloomberg, which showed Obama up by 13 among LVs), Obama has led in seven of ten surveys with a narrow advantage averaging 1.3 points. While ten pollsters and 1.3 points isn’t much, the overwhelming majority of state polls have applied a likely voter screen, and they show Obama with an advantage among likely voters in battleground states. Consider, for instance, that yesterday’s Quinnipiac surveys of Ohio, Florida, and Wisconsin were of likely voters. So either Obama has an advantage in the Electoral College, or Obama has a clear lead among likely voters nationally. My presumption is toward the latter until proven otherwise. 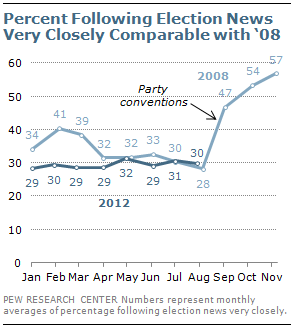 Interest in the presidential race will skyrocket after the conventions. Is it possible that the larger than normal likely/registered voter gap will persist after the conventions or debates? Yes. It could even widen. But it’s also possible that the gap will diminish if latent, predominantly Democratic voters tune-in. So I’ll be much more interested in the likely voter surveys in mid-September, and especially mid-October, than I am now. For the time being, my presumption is that the likely/registered voter gap will remain near its 2 percent mores, and that’s part of why I see Obama up by about 2 points nationally or perhaps a bit more. --In terms of the Fox News survey, it’s important to flag that they had Obama up 9 points among registered voters a few weeks ago. Realistically, there hasn’t been a shift in the race, so it’s useful to take a longer view of their polling. Since Romney won the nomination, Fox has shown Obama leading by an average of 4 points among registered voters, oscillating between a tie and a 9 point Obama lead. Realistically, the race hasn’t been swinging as wildly as the Fox News poll, so I’m inclined to assume that the most representative Fox poll would find Obama up 4 nationally and 1 point among likely voters, after figuring in the three point drop-off from last night. --The 7 point gap between likely and registered voters in the CNN poll is more interesting. My suspicion is that this won’t be typical for most pollsters. But I will observe that Obama’s 2 point edge among likely voters is right in-line with most other likely voter surveys. Instead, the 9 point advantage among registered voters is the outlier, so it strikes me as a little misguided to assume that the CNN poll ought to show Obama up by more than 2 points. Do parts of the CNN poll look a little off? Well, it’s a bit old: I estimate that 57 percent of likely voters were over age 50, compared to 43 percent in 2008 and 53 percent in 2010. But is that really more objectionable than showing Obama at 52 percent of registered voters? Probably not: American politics don’t divide as neatly among generational lines as most assume, so Obama’s lead only grows to 3 or 5 points if the poll is re-weighted to reflect a younger electorate. Put differently: is the base of registered voters off by more than the unusually old electorate? Since the answer to that question isn't clear, I'm not inclined to dismiss the poll or assume it's actually a hidden blessing for Obama point, as many seem to be on Twitter. --Finally: in the latest chapter of the bizarre polling in Missouri in the aftermath of Akin’s incendiary remarks, Rasmussen shows Obama leading Romney in Missouri, but a tied race in Virginia. Is it possible that Obama's getting an Akin bounce? I suppose, but don't kid yourself about his odds in November. A perfect storm wasn't enough for Obama to win Missouri in 2008 and Hurricane Akin won't do it in 2012.